In 1919, Salmson 2A plane he was traveling in Pierre Latécoère, flying over the city of Malaga an ideal place to land. It landed in an enclave called "The Romperizo". The aim of this pilot was to establish an airline that enlazase France with its colonies through Spain, reason why was looking for locations to set up different airfields. After appropriate test flights, on September 1 of that year that linked regular services to Malaga with Barcelona, Alicante, Toulouse, Tangier and Casablanca were opened. And in 1937 Malaga airport became airbase, ranking the School of Crew Members, Observers and Air Force Specialists. It is in 1946 when the airport is classified as customs and opened to domestic and international traffic. In 1948 civil passenger station is inaugurated, whose services were attended so far by the offices of the airbase. However, the most dramatic change in design was not produced until 1960, then, in addition to the extension of the runway and construction of track parallel taxiway, a new terminal zone is created in the center of flying field: in it a new aircraft parking, the control tower, a power plant and a passenger terminal building will be built. 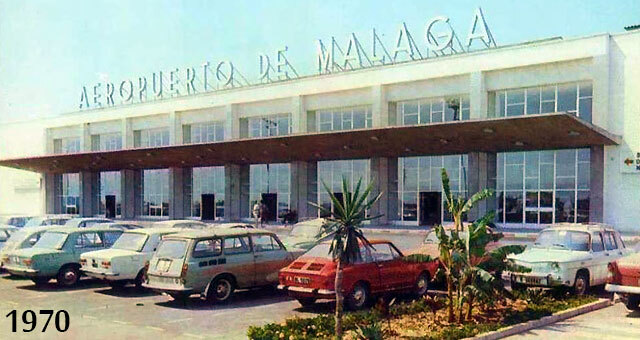 So far, the airport was known by the names of "The Rompedizo" or "Garcia Morato" but, by Ministerial Order of September 15, 1965, was renamed as today remains: Malaga airport. The new passenger terminal was opened in 1968, moving to this all national and international flights, which so far were treated at the temporary station. But increased traffic forces will soon build a new station in 1972. However, in the next decade it highlights the urgent need to build another terminal building to house the massive traffic the airport. So in 1991 the terminal "Pablo Ruiz Picasso", designed by architect Ricardo Bofill is Inaugration. This impressive building has two separate floors that separate flows of arrival and departure. The old terminal is attached and integrated into the new building. Obviously, it was necessary to build a vehicle parking building, which was ultimately opened in 1995. It is connected to the passenger terminal through a tunnel and it is being installed in car rental services without driver. In the same year we proceed to the remodeling of the old passenger building and to build a hangar for aircraft maintenance, and a cargo terminal. In 2002, a new modern control tower equipped with the latest generation technologies opens. But despite large investments, for more than a decade significant improvements in demand it himself. And it called "Plan Málaga" initiative of the Ministry of Development, responsible and through which an outlay of nearly 900 million by 2010, of which 330 are intended to be held airport. 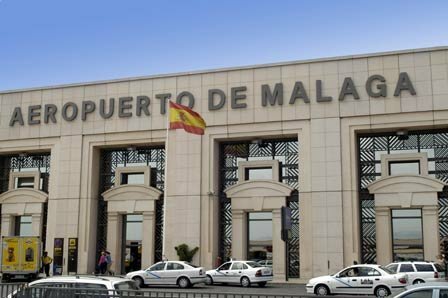 Keep in mind that Malaga Airport is the fourth in the country, handling 75% of the passengers of the Andalusian Community. In addition, more and more labor users (35% versus 65% of tourist). Among the improvements we will find: access, parking, new terminal (whose opening is planned for 2008), and the second track .... Ultimately, the greatest transformation in its history: the malacitano airport will become one of the most modern in Europe, achieving excellent customer service. The reform of the new terminal will have capacity to serve 9,000 passengers per hour, or what is the same, twice the capacity it has today. Result of Málaga Plan are the extension of Terminal 1 (T 1), the new building aparacamientos, seven floors, with capacity for approximately 2,500 seats, and the new end general aviation (for private flights, air taxi, flight schools etc. ), put into service today. Given the location of malacitano airport, next to a river, we think it is worth mentioning the efforts to achieve environmental protection of the environment. For this purpose, the University of Málaga is making a catalog of species of flora in the area; on the other hand, it is proceeding to the collection and conservation of flora and fauna of ecological interest. Transfer Malaga airport. Malaga Airport Limo. Car rental with driver Malaga Airport. Cars for weddings Malaga Airport. Shuttle Malaga airport. 4.6 of 5 based on 1014 votes.